Our Parish earth awareness was begun as early as August 2008 when the Parish newsletter highlighted "Creation Time" - a season of creation giving all Christians the opportunity to enjoy and celebrate the beauty and diversity of the planet. This time has been established by all Christian churches from September 1st to 4th October each year, the feast of St. Francis of Assisi, Patron Saint of Ecology. 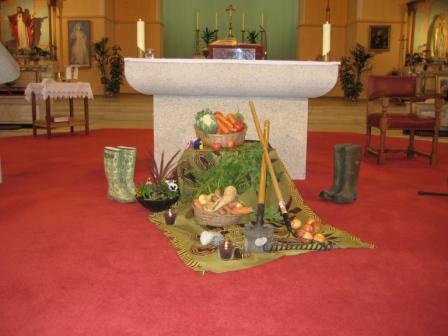 Cabra West Parish now has its own annual celebration of "Creation Time"during these weeks where earth awareness is promoted at all levels in the Parish with appropriate hymns and Prayer of the Faithful during Mass Liturgies. Durning "Creation time" we ask the school in the parish to make art work which they think reflects creation and the environment. It culminates with the Blessing of Pets and Animals on the first Sunday in October around the time of the feast day of St. Francis of Assisi. Cabra West Church during celebration of "Creation Time"
At the back of the Church in Cabra West there was a piece of land that had become an unsightly area. As part of the Parish's contribution to earth awareness the Parish Priest, Fr. John Greene, along with parishoners had this piece of land transformed into a beautiful garden with shrubs, trees, flowers and a vegetable plot. The people's appreciation of this initiative is evident by their respect for and admiration of this garden which enhances the neighbourhood. The "Be the Change" Symposium took place in the Parish Centre in March 2009. 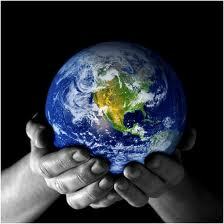 This workshop was a help with the practical implementation of daily living of earth awareness. In January - February 2010 a series of four information evenings of discussion and reflection took place. Speakers included: Sr. Catherine Brennan, who spoke on the eco-congregation Ireland www.ecocongregationireland.org. The theme of last year's Creation Time 2011, is "Our Daily Bread - Food in God's Creation". Sr. Angela Campion O.P. spoke on "Finding the Presence of God in all of Creation". This Symposium helped to deepen in the Parish community an awareness of the Season of Creation and its message. Awareness raising is a slow process but every little ripple creates another ripple. The following quotations are just two of many that were displayed on notice-boards and in the Parish Newsletter. "All creation is a symphony of praise to God". Hildegard of Bingen.